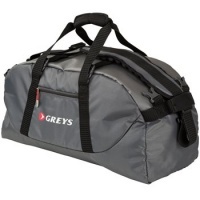 The Greys Duffle Bag is the ideal piece of luggage for the travelling angler and offers plenty of storage for your fishing gear, with a two-way carry design. This bag can be carried using the padded carry handles or you can flip it vertically and use the padded shoulder straps to carry on your back like a backpack. This will make it much easier and more comfy for you to carry the bag when you are travelling distances on foot. The bag is made from extremely durable rip-stop outer fabric material for long lasting use and features a large main compartment which is sealed by dual zips with Greys branded pullers. There is also a front zipped pocket, ideal for storing items you need quick access to like your keys or mobile phone. The Greys Duffle Bag has a super easy pack and unpack opening system and is grey in colour with red highlights throughout.